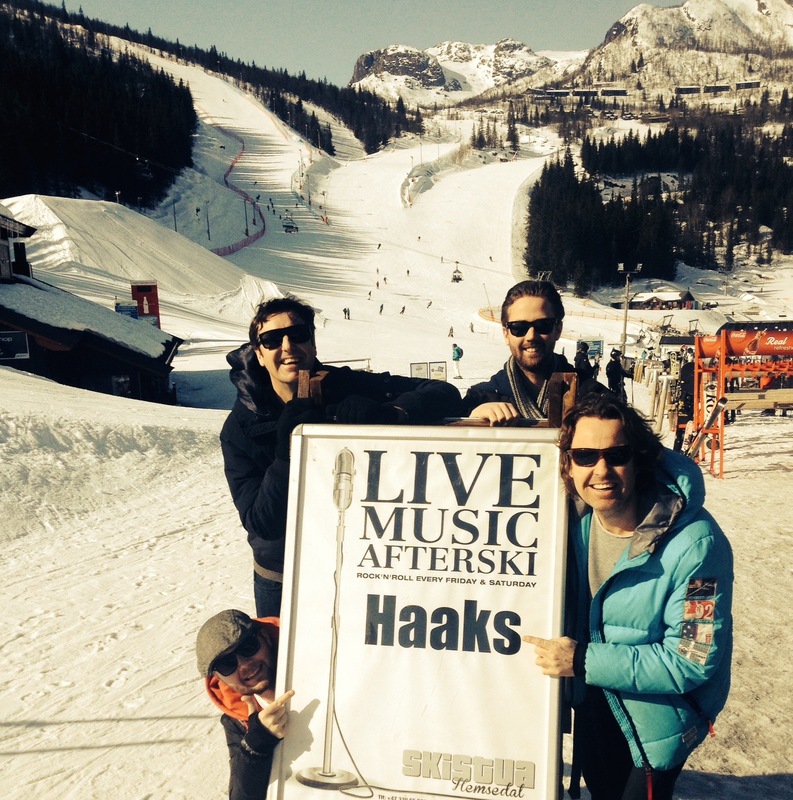 We’re Haaks, a show band who have been playing full-time for the past 24 years. It’s me Jonas (bass & vocals), my brother Johan (guitar & vocals), Mattias (keyboards), Roger (drums) and me Henrik (sound & light). From being mostly a night club band, we’re now doing more and more company events and happenings. Especially, we look forward to the after beach gigs in the summer and the after ski gigs in the winter. Nothing compares to entertaining people who are on vacation. Summertime, we’re mostly in Swedish Tylösand and Tanumstrand and wintertime is mostly about Swedish and Norwegian ski resorts. All gigs also mean that we spend a lot of time out on the roads and it requires good planning. At the time of writing we have just returned from vacation. After 130 gigs, last year, including 14 Christmas shows in Hotel Carlia Uddevalla, it was much needed. We’re proud of having sold out all the tickets already in September, so looking back at this success we now look forward to the winter season in the ski resorts. The winter tour dates were booked last autumn and we started planning the tour early spring a few weeks after last winter season closed almost a year ago. As we have families we strive to keep to three shows per week. This makes family life work even though we travel far on the roads. What people probably don’t associate with us is transports and logistics. Speakers, lights and boxes are all very well, but our touring bus is still the key for us to arrive on time. For the winter season, it is important to look through the bus and make sure everything works as it should. Previous years we’ve prepared the bus with sand, scoops and snow chains before going to the mountains. But, this year we skip that since we’ve had the bus equipped with automatic snow chains from Onspot. We just press a button from the driver’s seat and the snow chains are engaged. Pure magic! Finally, we’d also like to share some tips for planning a tour. Set up a touring plan for the entire tour. In which regions, cities and places will you perform, and when? Are there any limitations to time or number of shows that affect the touring plan? How many crew members are needed for the shows respectively? Is any training or personal preparation of crew members required? How do you get to the locations? Are you travelling by a tour bus? Is there room for everyone? Do you need a trailer? How much equipment will you need, and what has to be in place for the concerts? Is your touring vehicle prepared for the expected road conditions? For example, are snow chains available? What PA and lighting gear is required for the stage show? Now we’re heading for the Swedish mountains and hope for icy and snowy roads, so that we can try out our new automatic snow chains!